Bake My Day! : Bread Baking Babes bake bran! Bread Baking Babes bake bran! This past few weeks took us from happy to sad. Husband and I had two wonderful weeks together in Denmark, to return and find a dear friend passed away. Yesterday the group of friends from 40 years gathered to say goodbye, sharing tears, stories and laughter. And yes. There was bread to be baked. Life as it is, sadness, goodness, nourishment. 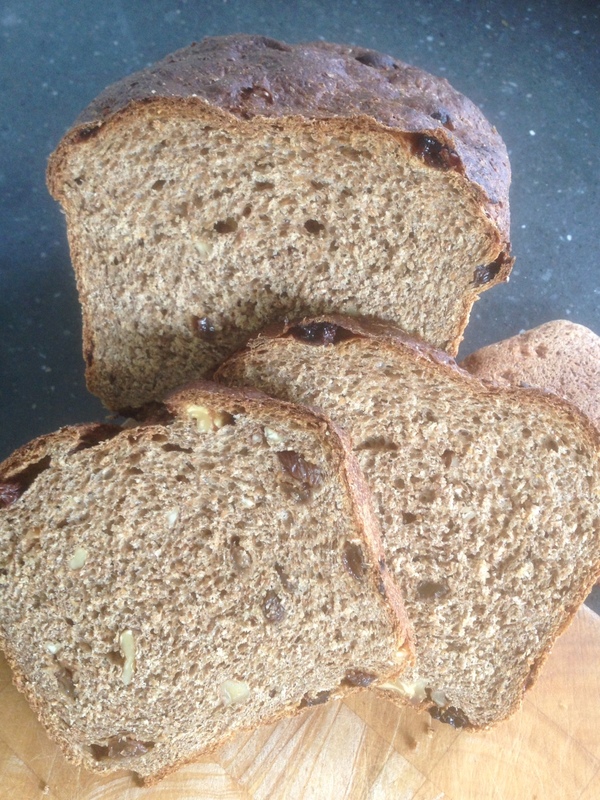 Lien as our Kitchen of the Month chose for us to bake an incredibly healthy whole wheat bread with added bran!! So... how whole can you go I ask you? Turns out you can add pretty much bran to the already whole wheaty goodness without baking a brick. Lien warned us that this bread asked for our Baker's savy-ness in terms of adding water, feeling the dough, timing the proofing and baking. I only bought my bran Friday, somehow I kept forgetting to bring it from the store. For the whole wheat flour I used the Graham Flour bought in Denmark which I believed to be a coarser whole meal but I found it quite soft.... so... I added a part of the coarser whole wheat already in the house. I added 75 grams of bran!! I didn't soak the bran, did soak the raisins but didn't soak the walnuts (soaking nuts? really?). I pretty much dumped it all in together and added raisins and nuts at the last minute. Water... I used loads of water! Initially "just" 340 gram but added more while kneading because I thought I was making Play-Doh. Strange enough this dough rose beautifully although it felt like coarse sand held together by Jello. So onwards I went. Shaping the dough into a log and using a bread pan to rise. I thought it had a nice dome pretty quickly and decided to bake. Well... I might have turned the oven up too high for too long. No ovenspring which I did expect to be honest because the second rise went so well. The bread stayed pretty much as it was when it went into the oven. The resulting loaf looking quite nice and promising but so heavy in the hand. Resulting slices of bread looking promising but dismissed by the husband as bread you have to work too hard on. I tried a toasted slice this morning and I must say I was surprised. It's a nice bread, granted, a little dense and heavy but as toast? Really really nice! The recipe is to be found here in English as well as in here in Dutch! It would be great if you could join this challenge, how much bran can you add to still make good edible bread? Get your bag of bran, knead, post and let us know how it went. And join us as a Bread Baking Buddy, send you results and what you thought of this to the Kitchen of the Month (that's me this time!) type BBB Brab Bread as subject to notitievanlien(at)gmail(dot) com and you'll be send a Bread Baking Buddy Badge that you can add to your blogpost if you like. Deadline the 29th of June. Take on the challenge and let's bake! I'm so sorry to hear of the loss of your friend. That is very sad news. I know what you mean about the bread being a little dense and heavy (a little??) but isn't the toast spectacular? It's stellar with melted cheese too. That is a sad situation to come home too, my condolences. your loaf looks very good. Yes I have a boy like that, doesn't want to go near all that bran and healthy stuff! He didn't go near it ever. The fun is that he then ate the 'normal' whole wheat, because it was "whiter" hahaha. I didn't make him any wiser understandably. I must say I wondered about the nuts-soaking, it's a little nuts really, I don't think they take much water because they're greasy right. And if your dough is wet enough anyway.... no need. I must admit I don't soak nuts either normally. Sorry about the loss of your friend. 40 years of memories are a treasure which I hope helps you through the sadness. Love your bread and how healthy it looks. Bet it made the best toast! So sorry to hear of the loss of your friend, I hope your gathering brought with it many happy memories. Your loaf is beautiful, both in color and shape. I was hoping for a little more oven spring myself but I am used to under-proofing with spelt and probably didn't let it go as much as I could have. Still, it did indeed make fabulous toast! I do soak nuts when I want them for eating or baking something later, but then you have to dehydrate them back to crispy. They are so much easier on my tummy that way. I can't eat raw almonds, but soaked and dehydrated are just fine for me. Same with walnuts. The bitterness is significantly reduced and I love the crispiness and snap that it adds. Like toasted nuts but not actually toasted. Really! That is interesting to know. Will try to remember! Life as it is, finding a way to deal with losses and all the uncertainty of our times. Sorry about the passing of your dear friend. Given that, nothing to worry about the whole-wheat bran bread. It's all good.